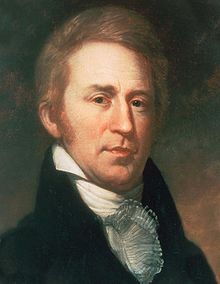 William Clark (August 1, 1770 – September 1, 1838) was an American explorer, soldier, Indian agent, and territorial governor. Along with Meriwether Lewis, Clark led the Lewis and Clark Expedition of 1804 to 1806 across the Louisiana Purchase to the Pacific Ocean, and claim the Pacific Northwest for the United States. Ocean in view! O! The Joy! Entry in the journal of the Lewis and Clark Expedition (November 7, 1805). Clark believed that the Corps of Discovery had sighted the Pacific; in fact, the body of water seen was the estuary of the Columbia River, some 20 miles from the coast. The quote, with spelling corrected, was for a time featured on the reverse of the nickel coin in 2005 as part of the "Westward Journey" series commemorating the bicentennial of Lewis and Clark's expedition. The Journals of Lewis and Clark hypertext from American Studies at the University of Virginia.